I’ve been posting a lot of stuff on Medium over the past year or so, from short stories to preview chapters of a novel I’m working on. A lot of the stuff I’ve posted has been members-only (since I like getting paid for what I write). I know a lot of people aren’t paying Medium members, so I’ve put together a short collection of some of my related stories for nonmembers to read. 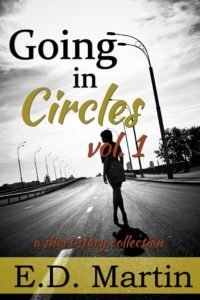 So yes, that means that Yours to Keep or Throw Aside and Waylaid on the Road to Nowhere are set in the same universe, although they’re both standalone novels and only connected by these short stories. Anyways, if you haven’t already read these stories on Medium, please check out this compilation. It also has the first chapter of Waylaid (which you can also read on Medium, if you have a membership, along with several other chapters of the book). And go ahead and read Yours to Keep or Throw Aside, too, if you haven’t already. Let me know in the comments below what you think about crossovers and shared universes, and whether you have any predictions about that sequel. Just like every year, I started out the month of November with the best of intentions. For the first time since 2012, I’m not in grad school so I’d have plenty of time to write this year! I work full time but don’t generally bring stuff home with me, which would leave me 7-8 hours to write every night. I only needed 1666 words per day, which would be simple to write in just a few hours. How could I lose? Well, it seems I could lose the same way I lose every year – life got in the way. I only managed about 10,000 words. This year, however, it wasn’t homework or work or just pure procrastination. No, this year Etsy was my downfall. I have a lot of interests, and one of them is crochet. I like to make my own unique creations as a way to relieve stress, and since I don’t really need a dozen octupi or aye-ayes or whatever else I’ve just made, I sell it all on Etsy. Based on past years’ experience, I know that November/December is when I’ll see most of my annual sales. I had planned to make lots of stuff year-round so I wouldn’t get swamped at the holidays, but just like with writing, life got in the way. And whoa boy, did I get swamped this year. 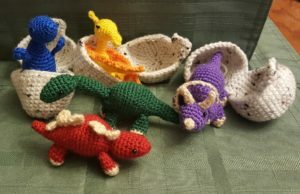 I have a new item, baby dinos in eggs, and they’re pretty popular. Which means all my time is going towards making them, rather than writing, because I’m kinda broke and need the immediate money from Etsy rather than the not-so-immediate money I get from writing. The good news is, everything should calm down in a couple more weeks, and then I can get back to writing. I’ve just finished the first draft of Captive and the Cursed, Book 1 of a new series of retold fairy tales-sans magic-avec Vikings that my writing group loves, and I’m super excited to get it edited and off to my publisher, hopefully to be released this spring. I’m also super excited to get started on Sleeping Shaman, book 2, as soon as edits are done on book 1. I have two whole weeks off for Christmas break and zero plans, so maybe I’ll be able to get some writing done. Even when life gets in the way. Every day from now until Christmas, I’ll be giving away copies of my books (digital AND print), Amazon gift cards, and book-related stuff. A new chance to win, every day! December 5th: prize carried over from the 4th because no one entered that day. C’mon people – it’s free stuff! After her husband’s infidelities are revealed, Kasey Sanford just wants to rediscover who she is. After an abusive childhood and years as a career soldier, Andrew Adams just wants someone to tell him that he’s doing the right thing with his life. When their paths cross, Kasey and Andrew embark on a tumultuous journey that demonstrates just what they’re willing to do to save the ones they love. Plus, each entry in the daily contests will be carried over to a big prize at the end (I haven’t decided what that will be yet, but it’s definitely something you want to win – more details coming soon)! 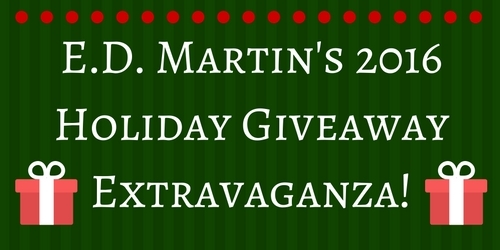 It’s Christmas time; there’s no need to be afraid – that I’d forgotten about the giveaway! It’s finals week, so I’ve been super busy the past few days with tests and papers, and I didn’t have a chance to post yesterday. So, to make up for it, today I’m giving away TWO books! When Frendyl’s family – and his whole race – is threatened, he embarks on a journey through the skies to recover a gemstone with magical properties. But that’s not the end of his troubles, as his father and cousin vanish in the mysterious Catacombs. Can Frendyl find them before an escaped prisoner does? These two books continue McFadden’s Amuli Chronicles, branching off in a YA format. Fill up the stocking, I may be rushing things, but win my novel again now – a paperback of Yours to Keep or Throw Aside! You’ll be doin’ all right, with your Christmas of white, but I’ll have a blue, blue blue blue Christmas if someone doesn’t win one of today’s THREE prizes! Said the writer to all her readers, Do you want what I give? A book, a book, desperate for a home, and that home could be yours! Forced to witness the cruelty of the Morality Police in his home city of Elih, Turkey, Recai is called upon by the power of the desert to be the vehicle of change. Does he have the strength to answer Allah’s call or will his dark past and self-doubt stand in his way? Pulling on his faith in Allah, the friendship of a Jewish father-figure and a deeply held belief that his people deserve better, Recai Osman must become The SandStorm. In the tradition of magical realism books by Margaret Atwood and Salman Rushdie, Shadow on the Wall tackles issues of religion, gender, corruption and the basic human condition wrapped in a beautiful and challenging page-turner not to be missed. This week I released a new title – Yours to Keep or Throw Aside. It’s about a housewife whose husband cheats on her, and she has to decide whether to fix her marriage or get into a relationship with a cop who has a lot of problems of his own. What’s that? This sounds familiar? Yes, actually, it is. We’ve retitled and re-released my 2013 debut novel, The Lone Wolf. The cover is different, but the content is still the same. It’s on sale this week at Amazon for only $.99. Make sure you get a copy if you haven’t read it yet! I got home from vacation last Sunday after a week wandering through the Southeast and was hit with chaos during the work week. Everyone asks me how I can stand to work with high school kids, but really it’s those elementary kids that wear you out! I think I need another vacation back to the mountains. 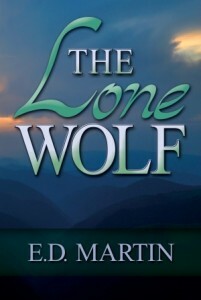 My women’s fiction novel The Lone Wolf is set in Asheville, NC, near where I was traveling, so I’m pulling from it all month. When Kasey’s marriage falls apart, she turns to Andrew, a soldier she just met, for help. But their friendship pulls up a past he’d rather avoid. Can Kasey save Andrew from himself while saving her marriage too? In this scene, Andrew’s girlfriend, Lauren, is trying to convince him to move to Asheville with her, where she’s headed for a new job. Smiling in spite of myself, I leaned in and kissed her. Lauren had a way of defusing our fights, of winning me over to her opinion. Post a link to your eight sentences blog entry, or join the fun at the Weekend Writing Warriors website. Then pick up a copy of The Lone Wolf at Amazon, or the audiobook at Amazon, Audible, or iTunes. Happy August! This month I’ll be posting from my debut women’s fiction novel, The Lone Wolf, which is on sale at Amazon for just $.99 this week. In this scene, Andrew is describing the first time he saw Kasey. He was at a bookstore cafe and she was looking in the window from the sidewalk. Then pick up a $.99 Kindle copy of The Lone Wolf at Amazon, or the audiobook at Amazon, Audible, or iTunes.